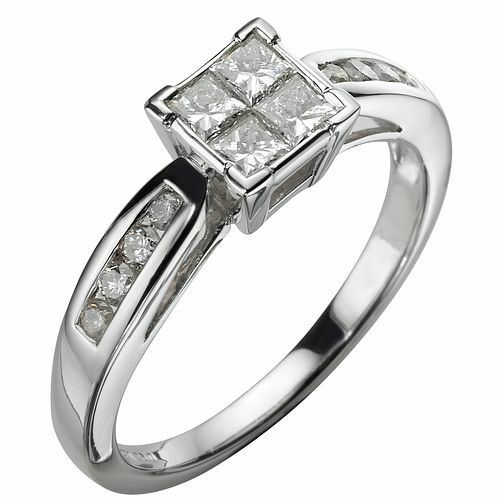 Rare and highly prized, the precious metal platinum is an inspired choice for a special ring. A cluster of four princess solitaire diamonds in an invisible setting is complemented by diamonds running down the shoulders of the band to complete the look. Platinum 60 Points Ring is rated 5.0 out of 5 by 4. Rated 5 out of 5 by Anonymous from Stunning Ring My boyfriend proposed to me with this ring. Wow what a ring, its stunning! Rated 5 out of 5 by Anonymous from Fabulous ring This ring was bought for me as a present for a 'special' birthday. It is a beautiful, well made ring and is something I will treasure.